Complete an MSF (Motorcycle Safety Foundation) Course. In case you're wondering, yes, most course requirements include assignments, lesson attendance, a written exam, and an on-motorcycle test. But don't let this discourage you! When it comes down to it, the specially trained MSF Basic RiderCourse instructors will teach you how to ride a motorcycle much better than a blog can. And, while completing the course doesn’t guarantee your safety (ultimately, as the rider, you guarantee your own safety), these courses will allow you to continue honing your skills on the road. Yeah, nothing looks cooler than leathers on a motorcycle, but they also serve another important purpose: injury prevention. Live by ATGATT: All The Gear, All The Time. Wear the safety gear, follow the rules, and you’ll stay safe. Wear a helmet. It should go without saying why your headgear is such a critical piece of equipment. Also, wear gloves. Just picture what happens when you trip and fall while walking—how do you catch yourself? It’s instinct to put your hands out in order to break the fall. This isn't to say that wearing leather gloves will 'catch' you, but they will help your hands fare better against asphalt at high speeds. Just don’t. Please, for the love of all things Harley. Don’t be stupid. So you carefully shopped around for the best motorcycle for beginners, and you finally bought your first scoot. Now it’s time to make it your own. While you may be excited about all the awesome mods you’re going to make when you buy a motorcycle, you may want to wait on that. Get accustomed to your bike’s balance and feel before you deck it out. This will come in handy after you modify your bike, too. Learning the stock sounds and movements of your motorcycle will help you realize when something isn’t running properly. If you’ve never had to learn how to ride a motorcycle before, don’t expect to be able to flog it your first time around—no way. You’ll just have to make peace with the fact that it might be a while before you let loose. Instead, find a big, safe area to ride around in. Empty parking lots are the perfect practice getaway because they offer riders a wide, mostly unobstructed area to become better acquainted with their ride. Avoid blind spots at all costs, and always, always maintain proper spacing. Learn to predict the movements of cars, always look both ways at intersections (maybe even twice), and never get distracted. Riding recklessly beside big, honkin’ vehicles is one sure way to reserve a space for yourself on the big road in the sky. Stay safe. The road is wide, and you and your bike are itching for long-distance journeys. While a cross-country road trip seems like a great idea right now, you need to remember your limits. New riders can find lengthy journeys pretty tiring, so it’s a good idea to take short trips at first. Then, as you get used to your bike’s demands, you'll be able to expand your journey's radius and make longer trips. Everyone has to start from scratch. 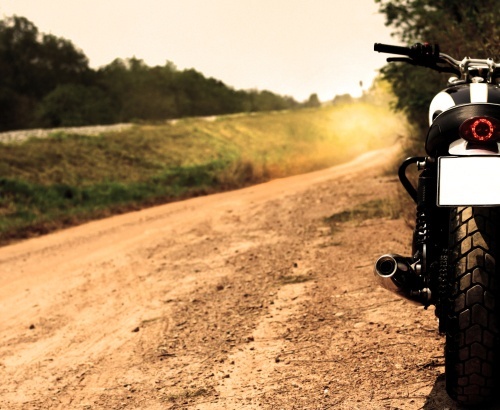 Believe it or not, even the most seasoned of bikers have had their fair share of “oops” moments and mess-ups. (I'm speaking from experience.) Don’t lose heart, the only way you’ll catch on is with practice. While it may seem like a tiresome learning process with a lot of homework, remember to relax, take it easy, and enjoy the ride. When you buy a motorcycle, you have taken a step into a new way of life. So, welcome! Enjoy. Ready to ride? RumbleOn is the best place to buy motorcycles online. You may be new to riding, but you're no rookie when it comes to online shopping. Where else can you buy a cheap used motorcycle online and have it shipped for FREE? RumbleOn has the largest online inventory of used motorcycles for sale online, and every RumbleOn certified used vehicle comes with free shipping, as well as a Money Back and Rideability Guarantee! Shop for used motorcycles and find a great first ride to hit the road in style! Rider. Writer. Harley life-r. Follow my coverage of everything from tips for motorcycle riders, to motorcycle humor, and everything else to do with living life on two wheels. If you're looking for resources on how to sell a motorcycle or if you want to buy a motorcycle of your own, RumbleOn is a great resource! Check out the easiest place to sell a motorcycle online, and browse through one of the largest pre-owned motorcycle shops on the web!